At least 40 people have been hurt in a series of violent incidents on the closing day for nominations in Sri Lanka's general election. The party activists were hurt on Tuesday as a record 6,024 candidates were registered to contest 225 seats. Tamil Tiger rebels marked the opening of the campaign by warning of "serious consequences" if their supporters were obstructed from voting. The poll was ordered for 2 April after the president dissolved parliament. Police said there were 27 violent incidents on Tuesday in southern and north-central regions in which the 40 activists were injured. Twelve arrests were reported. A senior police official said there had been 82 incidents so far of violations of the election law, ranging from removing rivals' posters to intimidation and outright violence. The BBC's Frances Harrison in Colombo says the violence has prompted poll watchers to express fears about the next six weeks of campaigning. One such group, the Centre for Monitoring Election Violence, issued a statement expressing concern about the geographic spread of the incidents and the fact that they all involved the two main political parties, the People's Alliance and the United National Party (UNP). The statement noted that in previous elections, these two parties were responsible for three quarters of the violence. President Chandrika Kumaratunga, who heads the People's Alliance, has called the election almost four years ahead of schedule. She has been locked in a feud with Prime Minister Ranil Wickramasinghe, head of the UNP, whom she accuses of yielding too much ground to the Tamil Tigers during a fragile two-year peace process. 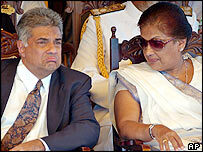 Mrs Kumaratunga is hoping to gain control of the legislature as well as the executive, while Mr Wickramasinghe is trying to show he alone can lead the country to a peace deal with Tamil rebels. The rebels are backing proxy candidates in the moderate Tamil grouping, the Tamil National Alliance. The Tamils may end up holding the balance of power as the vote of the majority Sinhalese will be split between the parties of the prime minister and president. SP Thamilselvan, the head of the Tigers' political wing, warned on the pro-rebel TamilNet web site that the polls had to be "free, fair and peaceful". "The consequences will be serious if the rights and wishes of our people are denied," he said. 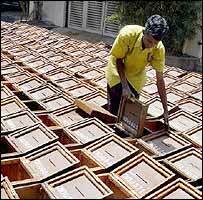 A military blockade stopped many Tamils voting in the general election in 2001. A total of 24 recognised political parties and 192 independent groups had put their names forward for the election as nominations closed on Tuesday. The number of candidates is the highest since Sri Lanka won independence from Britain in 1948. Leading political parties have scheduled big rallies for Thursday to start their campaigns.